L. Neill Cartage Co., Inc. was founded by Lew and Jean Neill in 1946, as a one truck delivery service in the Chicago area. 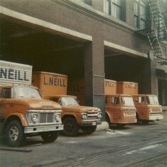 In order to compliment the local cartage operation, Neill undertook its first major expansion into public warehousing in 1966. From there, Neill built a 210,000 sqft. warehousing/distribution center in Berkeley, Illinois, which it has occupied since 1979. The facility is siding-served by the Union Pacific Railroad at Proviso Yard. Over the years, Neill has expanded its public warehousing operations with the use of outside facilities and also implemented / operated a number of contract warehousing and distribution centers. These have included facilities in West Chicago, IL, Bensenville, IL, Hodgkins, IL, and Salt Lake City, UT. We realize that even with all the recent advancements in technology and equipment, people ultimately make the difference. Through a dedicated, customer oriented workforce, Neill Cartage has become one of the premier full-service logistics and distribution companies in the Midwest. We take pride in what we do and approach any and all tasks at hand with a professional manner. 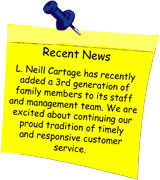 All drivers, warehouse, shop and office personnel are employees of L. Neill Cartage Company, Inc.